These pages are all about Classic Motorcycles and riding and maintaining them to keep them on the road. However, while reading an article on a sixties' caferacer- meeting, saying " ... they were all wearing Pudding Basins and Leather Jackets ... " , I thought this could be what I was looking for, as it was the proper riding gear until the end of the sixties and early seventies, when the "Classic" era had come to an end.
" Huh ? What is your definition of “Classic" then ? " I hear you asking. Well, I don' t think you can set an exact date - like 1960 - to define the beginning or the end of a certain era. There' s always a gray area, when manufacturers adopt new technologies or trends. The first patent for a two-wheeled vehicle, was seen in 1817, when Baron Karl Drais invented his so-called “Hobby Horse" or "draisine". It was mainly constructed from wooden beams and had no pedals, hence its name “running machine". Only a year later, Denis Johnson ( England ) patented a much improved running machine with better steering. The “Velocipede" - from Latin: Velox (swift) and Pedis (feet) - was copied and bettered by others, but we had to wait until the mid- 1860s, when the first pedal-assisted two-wheeler arrived. Now while there had been steam-powered three, four ( - or more - ) wheeled vehicles since the end of the eighteenth century, they all suffered from the massive weight of the steam engine and its need for lots of water and coal to make it suitable for light, personal transport. However, in as early as 1869, L.G. Perreaux ( France ) built a small steam engine and fitted that onto a modified Michaux bicycle frame, while S. Roper ( USA ) fitted a small steam engine between the wheels of a bicycle. Due to the very limited space to carry water and coal, these machines only had a short range, but definitely showed what was possible. Étienne Lenoir, a Belgian-French inventor, had patented a 2-stroke engine which burnt a mixture of coal gas and air in 1860. This was the first internal combustion engine built in larger quantities and formed the base of the modern internal combustion engines. These were used to power other machines in factories, but he also built several 3- wheeled carriages. In 1863, he built a petroleum- burning engine that featured a primitive carburettor. 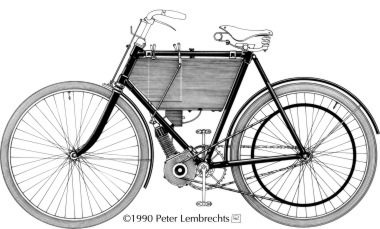 However, the Lenoir internal combustion engines were too big for use in a velocipede, but saw many improvements made by other engineers and in 1876, German engineer Nikolaus Otto developed the first practical four stroke cycle engine. Another German engineer, Gottlieb Daimler - who had worked with Nikolaus Otto - started to develop his own Otto-cycle engine together with Wilhelm Maybach. Their aim was to produce a much smaller engine than those made by Otto. In 1883 their engine was patented and by 1885, another patent showed what - to this day - is seen as the first motorcycle to use an internal combustion engine. The machine was made of wood and had two side-wheels ( both inventors couldn' t ride a bicycle... ) and looks pretty archaic today, but it was a very serious step forward. 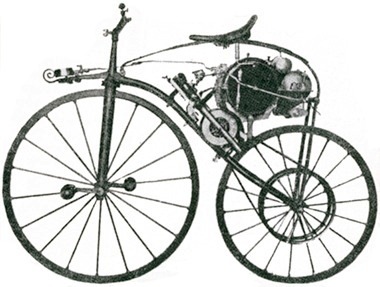 Above: The 1885 Daimler “Einspur"
Meanwhile, the velocipede had seen some big improvements as well. By the 1870s, the “boneshaker" was replaced by the “ordinary" machines, having a tall front wheel and a small one at the rear. Iron frames and wheels were used instead of wood and they were produced in large numbers. 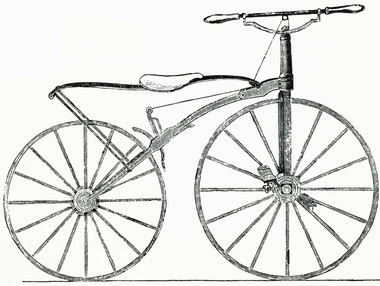 In 1879, Harry Lawson showed a machine with chain-driven rear wheel and in 1884, John Kemp Starley introduced the first “Safety" bicycle, produced by Rover. 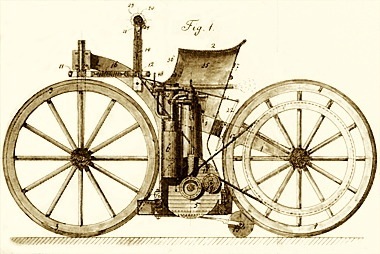 Many inventors began to develop their own versions of motorized two-wheelers and in 1887 Felix Théodore Millet ( France ) patented a motorized five cylinder wheel. A few years later, he fitted the wheel into a bicycle frame. Technically, the Millet machine was highly advanced, featuring front and rear suspension, twist grip throttle control, carburettor and battery ignition. It was the worlds first multi-cylinder motorcycle and the engine was the first rotary engine. This design was improved by others and used extensively in aeroplanes during the following decades. 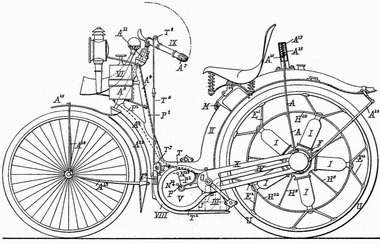 Above: An 1896 patent drawing of the Millet motorcycle. 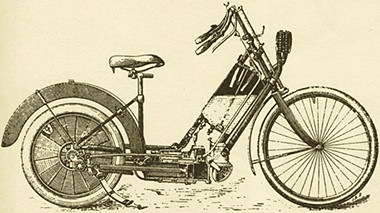 The worlds first true production motorcycle, was the Hildebrand & Wolfmuller, patented in 1894. It had a watercooled 1488cc horizontal twin cylinder engine in an open duplex frame and the rear wheel axle doubled as the crankshaft. It was not that reliable though and production ended in 1897. By the end of the nineteenth century, small capacity engines and safety bicycles became readily available, so many small workshops emerged, producing motorized bicycles up into the first years of the twentieth century. 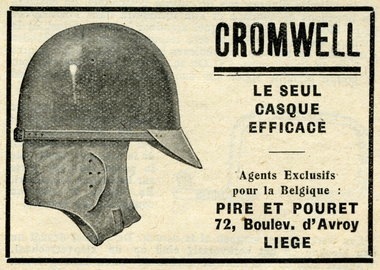 Below is a Belgian 1902 Légia. Its clip-on engine is mounted in front of the down tube of a normal safety bicycle. Auxiliary engines were produced by De Dion Bouton, Fafnir, Minerva, Dufaux ( Motosacoche ), Zürcher & Luthi, Zedel and many others. Soon, the motorcycle got its own distinct frame, better braking systems, more powerful and reliable engines, a clutch, a gearbox, front suspension, etc. 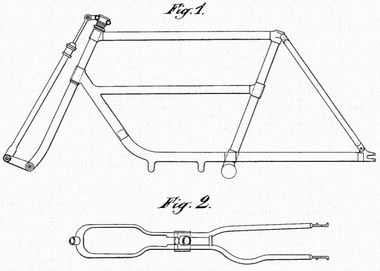 Below: a 1907 frame drawing by the famous Paul Kelecom, working at the shaft-drive FN motorcycles at that time. During the first decade of the twentieth century, engines, carburettors and ignition systems became much more reliable than before and rallies and even races proved their capabilities. Automobiles had been developed alongside the motorcycle and the aeroplane followed suit. In 1909, Louis Blériot crossed the English Channel in his Blériot XI monoplane. Sadly, a few years later, the world was at war - again. Governements and armed forces saw the possibilities of those motorized vehicles and ordered them in huge numbers.